Amazon, founded by Jeff Bezos in the year 1994, is one of the largest American e-Commerce companies in the world. It was the first company to start online retail shopping in the USA. Amazon is setting a benchmark for many of the e-Commerce players in the world, by offering more than 80 categories of goods on its platform. With time, Amazon has also ventured into the mobile platform & its mobile apps have been downloaded more than 100 million times just in India in less than 3 years. With its wide range of product line & efficient logistics, Amazon is indeed turning out to be the global leader in the world of e-Commerce. Can't wait to get started right away? Check out our ready-to-go eCommerce Mobile SDK. It's native & 100% cusomizable. 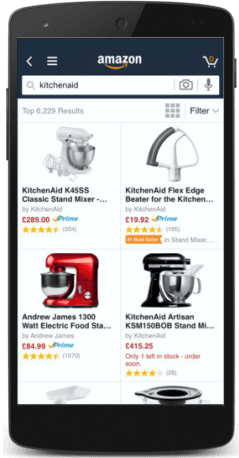 Want an Amazon look-alike eCommerce App? With more than 10 years of expertise, we're perfectly capable of delivering a similar application on time; efficiently. Working with us comes with the assurance of getting a beautiful & engaging mobile application that enables you to maximize your returns on your efforts.